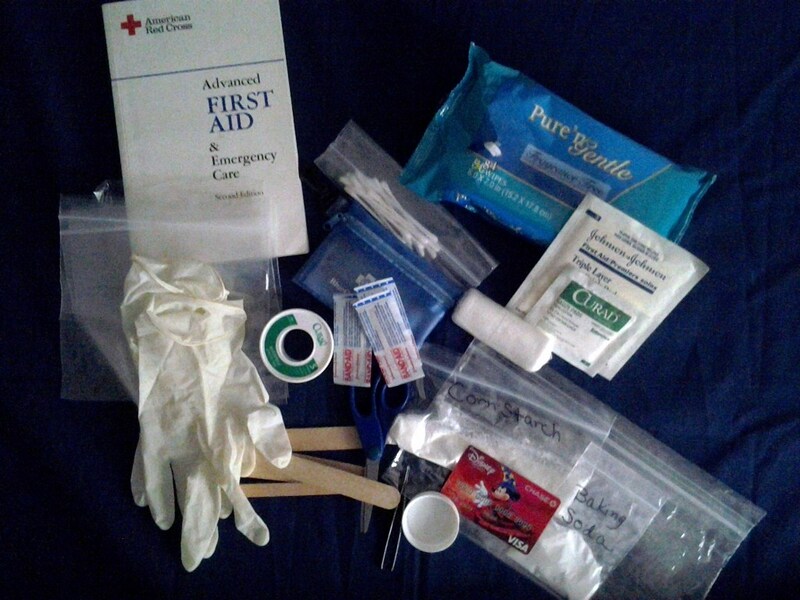 Kid-friendly First Aid Kit by Fran W.
A small first-aid kit is good to carry when you are exploring the great outdoors, even if it is in your own backyard! This kit has been designed for children to carry with them in their nature backpack and does not include any medicine or harmful chemicals. Children should know how to use the items in this kit properly before going out. The following materials can be used to: remove splinters, take care of minor cuts and scraps, relieve bee/wasp stings and to stabilize minor sprains. If you feel that your child is ready, encourage them to take first aid classes through the Red Cross and purchase a commercial outdoor first aid kit for them. This kit should not be expected to take the place of a medical professional. In the event of a real emergency, your child should know when to call 911 and/or seek medical attention. Splinter tweezers – to remove splinters caused by thorns, prickly plants, wood, etc. or fracture. Seek medical attention as soon as possible if this should happen. Snack-sized and sandwich-sized plastic bags – To store powders and items individually and to keep them from getting wet. Can also be use for trash. Note: It is assumed that your child will always have a bottle of fresh water to make a paste out of the baking soda but the baking soda can be applied directly to the skin dry. To make a baking soda paste for a sting, put 1 tablespoon of baking soda on the plastic lid and add just enough water to make a paste, mix with a cotton swab and apply with the same cotton swab. Make sure hands are clean whenever taking care of broken skin. Practice making the paste so that your child knows how to do it when needed.